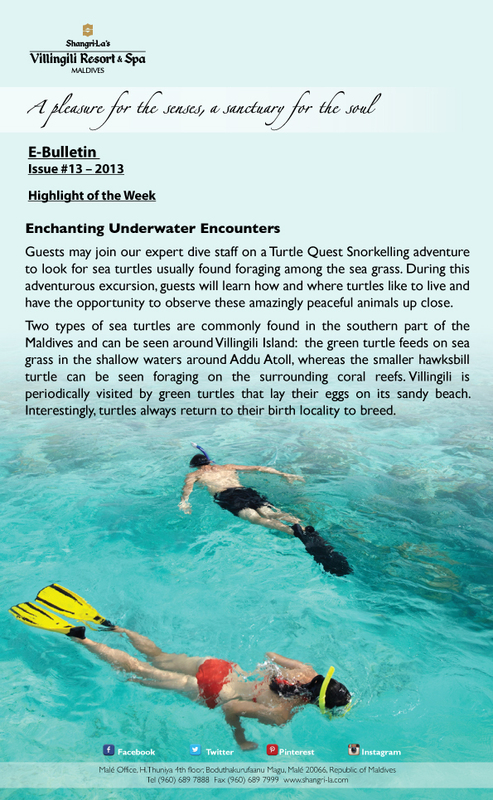 Guests may join our expert dive staff on Turtle Quest Snorkeling adventure to look for sea turtle usually found foraging among the sea grass. 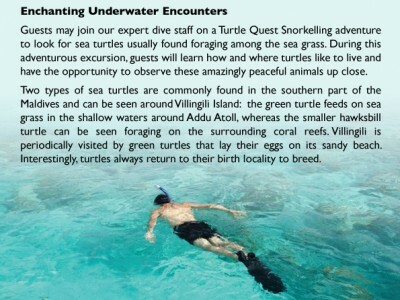 During this sea adventurous excursion, guests will learn how and where turtles like to live and have the opportunity to observe these amazingly peaceful animals up close. Two types of sea turtles are commonly found in the southern part of the Maldives and can be seen around vilingili Island: the green turtle feeds on sea grass in the shallow waters around Addu Atoll, whereas the smaller hawksbill turtle can be see foraging on the surrounding coral reefs. Viilingili is periodically visited by green turtles that lay their eggs on its sandy beach. Interestingly, turtles always return to their birth locality to breed.